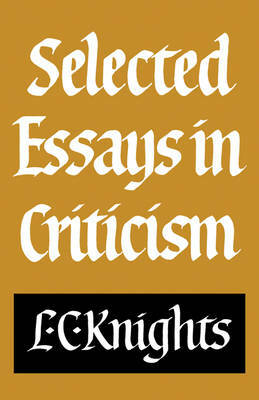 This is a selection of essays by one of the most distinguished of modern literary critics, L. C. Knights, published as a companion volume to the selection of Professor Knights' Shakespearean essays, which appeared in 1979. The essays span almost four decades of critical work on authors as diverse as Marlowe, George Herbert, Clarendon and Henry James. At the centre of each essay is an attempt to elicit some essential quality in the author, or authors, discussed. Although each can be read as an isolated critical essay, the different pieces are linked by a pervasive interest in the conditions, social or personal, out of which particular works emerged, and in the way in which major works of the imagination are renewed as they are re-interpreted in successive generations. Throughout, the underlying assumption is that literary criticism needs to be 'pure' - the result of direct exposure to particular works - but that it cannot remain purely literary, if only because the meaning of literature includes its effects on the lives and conduct of individual human beings.